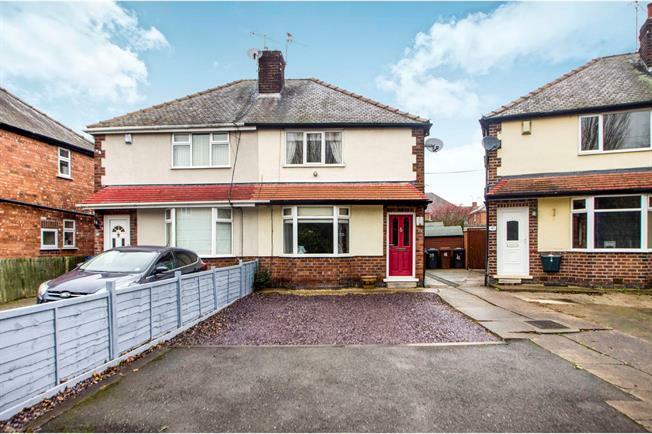 2 Bedroom Semi Detached House For Sale in Nottingham for Asking Price £150,000. An immaculately presented two bedroom semi-detached home situated in the heart of Sandiacre benefitting from off road parking. The accommodation briefly comprises of entrance hall, lounge with bay window, kitchen/diner. To the first floor there are two bedrooms and family bathroom. To the front of the property there is off road parking for several cars. To the rear of the property there is a well maintained enclosed garden mainly laid to lawn with patio and decked areas. A viewing of the property is highly recommended. Composite double glazed door to the front and stairs leading to the first floor. Double glazed uPVC bay window to the front, radiator and inset gas fire. Roll top work surface incorporating built-in wall and base units, sink with drainer and mixer tap, integrated electric oven, integrated gas hob, overhead extractor, space for dishwasher and fridge/freezer. UPVC French double glazed door opening onto the garden, double glazed uPVC window facing the rear and radiator. Access to the under stair storage cupboard which offers plumbing for a washing machine. Low level WC, pedestal sink, panelled bath with shower over and radiator. Double glazed uPVC window with frosted glass facing the rear. To the front of the property there is off road parking for several cars. To the rear of the property there is a well maintained enclosed garden mainly laid to lawn with patio and decked areas.